Argan oil is often referred to as "liquid gold". Its multi-functional properties made it become very popular in skin care and personal care products. Argan oil is almost exclusively produced in southwestern Morocco. Local women cooperatives extract the argan nuts in between two stones and extracted raw oil by hands in the past. It takes 3 days to make 1 liter of oil. Therefore, it is very precious. Traditionally, argan oil was used extensively on skin to treat various conditions such as dry skin, acne, psoriasis, eczema, wrinkles, and skin inflammation. It was also used to prevent hair loss and dry hair. With the improvement in technology, it permits a larger extraction yield of argan oil nowadays. Virgin argan oil is produced by Moroccan women cooperatives and their world-wide marketing activity contributes to the argan forest sustainable development. Virgin argan oil is composed of primarily fatty acids, vitamin E (tocopherol), triterpene alcohols, sterols, squalene, ferulic acid, D-7 stigmasterol, polyphenols and triterpene alcohols. Fatty acids are mainly oleic and linoleic acid which contribute to the benefit of argan oil for skin inflammation. How to Use Argan Oil? Apply a few drops of Argan Oil to face day and night after cleansing. When used before applying liquid or powder makeup, it serves as a skin primer yielding a smoother skin surface. Use index fingers to apply by pressing gently in a circular motion until absorbed. 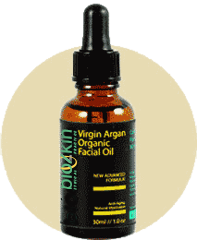 Argan face oil can be used as a booster for your skin serum and moisturizer. Simply add 1-2 drop(s) into your serum or moisturizer, and mix well in your palm and gently press onto your face. Vitamin E (Tocopherol) Antioxidant, free radical scavenger, improves skin's water-binding ability, boosts the effectiveness of your sunscreen, and heals dry, damaged skin. Argan Oil contains 200-300% more Vitamin E than olive oil. Essential Fatty Acids Essential to the health of your cellular membranes keeping the skin firm and elastic while improving moisture retention. Oleic & Linoleic Acids Critical in the formation of prostaglandin, which acts as a natural anti-inflammatory and healing agent. Natural Antioxidants Protect your skin from environmental factors like chemicals, pollution, and sun damage – preventing free radical damage and giving your skin that hard-to-achieve "glow". Squalene Naturally produced by your skin, it functions like Vitamin E as an important antioxidant, reducing signs of aging. It also has many wound healing & antibacterial properties, excellent for eczema, psoriasis, and acne. Polyphenols Fight sun damage and photoaging with UV protection. Promote skin repair with anti-inflammatory, anti-septic, and free-radical fighting properties. Ferulic Acid A very rare antioxidant that's highly valued as it actually becomes more potent when exposed to sunlight. Sterols Help prevent skin aging by promoting moisture retention as well as optimizing the function of skin barrier. D-7 Stigmasterol Very rare and highly regarded for treating skin diseases, healing wounds and compromised skin tissue. Triterpene Alcohols Recent studies show topical application may offer potent anti-inflammatory benefits, making them effective for speed healing of a variety of skin conditions.